Celina Reyes and Sandra Lopez each hugged Yolanda Haywood, M.D., RESD ’87, B.S. ’81, associate dean for diversity, inclusion, and student affairs and associate professor of emergency medicine at the GW School of Medicine and Health Sciences (SMHS), before slipping into their first white coats. “This ceremony is for you to remember, to lock that into your head that you will be successful, and we will be here to help ensure that you’re going to be successful,” Haywood said. Lopez, with her cell phone camera, captured Reyes in her garb; the latter flashed the peace sign and posed. The two, both students at E.L. Haynes Public Charter School in Washington, D.C., were among 13 local high school and charter school students comprising Cohort 3 of the GW SMHS DC Health and Academic Preparation Program (DC HAPP). The program was restarted this year after the initial grant, which launched in 2009 through a U.S. Department of Education grant, ended in 2011. Haywood and Grace Henry, Ed.D., director of the Office of Diversity and Inclusion at SMHS, are DC HAPP’s leaders, along with Kirsty Fontaine, M.P.H. '15, graduate assistant for Diversity and Inclusion. With a hands-on, immersive approach to medicine and health care, DC HAPP allows qualifying students — they must receive a recommendation from a teacher or guidance counselor, be a rising high school senior in a D.C. public or charter school, and be in need of financial support — to explore a potential career path. The white coat ceremony was the first step. The steps that followed over the next four weeks included a visit to the Gross Lab to examine cadavers; CPR certification training; a trip to the VA Medical Center, a favorite of Reyes, who found the relationship between the veterans and their health care providers touching; and a stop at the birthing simulation center. At the halfway point of the program, the cohort gathered in the WISE Lab to learn how to suture. Instead of putting on white coats as they had at the beginning of the program, the students pulled on yellow surgical coats and snapped rubber gloves onto their hands. 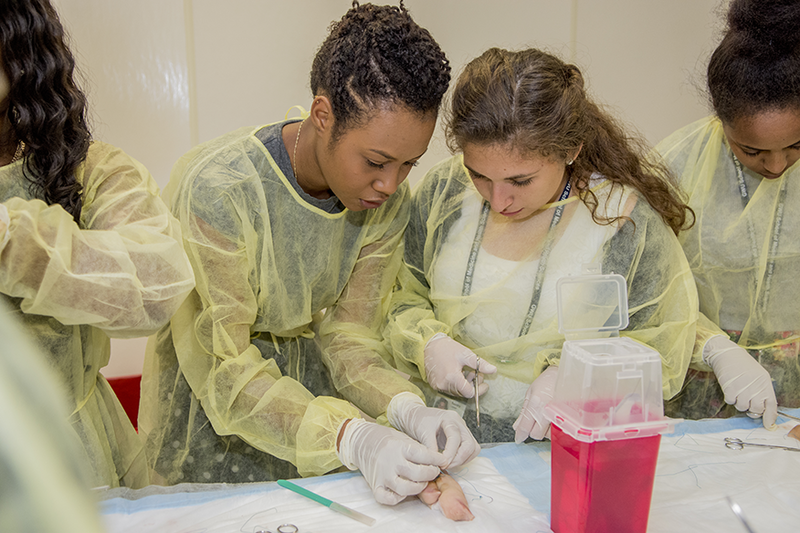 Cohort 3 grasped curved needles and pulled thread through incisions in pig feet under the watchful eyes of Haywood, DC HAPP mentors Alexia Charles, a second-year medical student, and Damien Pinkett, M.P.H. '15, and additional M.D. program volunteers. “Oh my god, that looks so cute!” Lopez exclaimed after examining her line of stitches. Next to her, Bontu Kumsa, from Columbia Heights Educational Campus, carefully tied knots, working her way down the wound. The “good experience” was a refrain from all of the participants, and Peralta, Reyes, Lopez, and Kumsa each plan on pursuing medicine in the future, thanks to DC HAPP.